Screen size: Up to 100"
An Optoma projector can take your home cinema set up to the next level. When you’ve got an Optoma projector, your friends and family will want to watch all their favourite films with you. A big screen makes a big difference when it comes to films, and it doesn’t matter what you’re into, from black and white oldies to the latest Hollywood blockbusters, everything looks better when it’s projected by an Optoma projector. If you’re serious about film, an Optoma projector is the way to go. And playing games will never be more immersive when you hook up your PC or console to an Optoma projector. 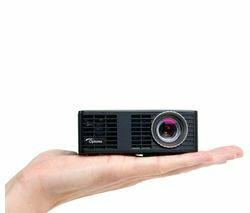 When you browse our range of Optoma projectors, you’ll see there are several different types to choose from, so you’re bound to find something to suit your room, no matter how big or small it may be. You can also use an Optoma projector for meetings and presentations too, so there’s no limit to how useful they are. If you want to watch films as they were meant to be seen, check out our Optoma home cinema projectors, and if you don’t find something you like there, don’t forget to take a look at our full range of projectors. If you’re looking to maximise your gaming or home cinema experience, an Optoma projector is ideal.